Estwings 53 oz. dead blow hammer has power from within through the movement of hundreds of steel shot for maximum power and control. Steel canister, with steel shot, and steel handle are completely encased in polyurethane, which is oil and chemical tolerant. Eliminates or minimizes denting and marring. Reduces swing fatigue, sting and vibration. Protect your eyes from flying particles and dust. Always wear safety goggles. Bystanders shall also wear safety goggles. Tbook.com crawls the web to find the best prices and availability on Estwing and related Tools and Hardware products like Estwing 53 oz. Compocast Dead Blow Hammer. For this page, related items include products we find that match the following keywords: "Estwing" at our vendor partner Home Depot. Estwing 53 oz. 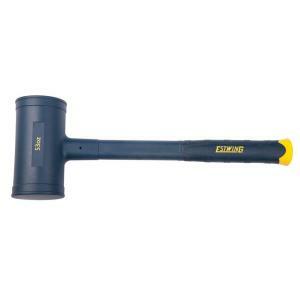 Compocast Dead Blow Hammer is one of 156 Estwing and related products listed in the Tools and Hardware section of Tbook.com If you have any questions on this product, please give us a call at 734-971-1210 during the hours of 9am - 5pm EST for assistance. Thank you for shopping at Tbook.com, the Internet Department Store!